The S100 was my first digital camera, and it’s still in heavy use. (Editor’s note – since replaced in 2003 by a Canon SD110 and in 2007 by a SD1000…) I bought my S100 in 2000 while on contract to a client in San Diego.Â I was looking for a cameraÂ to take pictures of my travels and looking for something to kill time in my hotel room. 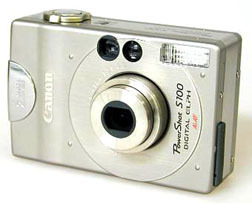 The Powershot S100 (or Digital Elph, as it was known) has spawned cameras with higher resolution, cameras that take Secure Digital cards, longer zooms, and more sensitive CCDs. The S100 still has a place in my heart, though. It’s easy to use, small enough to take everywhere, and the controls fall easily to hand. The S100 has an all-metal body, 2x optical zoom, 4x digital zoomÂ and somewhat limited exposure controls – white balance and exposure compensation only. The camera produces jpeg images in 1600×1200Â fine and superfine resolution and 640×480. The camera uses a small, proprietary Nickel Metal Hydride (NiMH) batteries, which is almost a requirement in a camera this small. Fortunately, Canon has used the same battery in other cameras and batteries are available reasonably from Canon and third-party manufacturers. I’ve been happy with the resolution of prints made from my S100 at 1600×1200. Since most of my photos end up on the web, I use the the 640×480 mode for street shooting. I can fit an ungodly number of shots on a 128 megabyte compact flash card. Recycling Time Approx. 10 sec. Interface USB: Cable connection via camera’s USB port is limited to genuine Apple Computer brand models with a built-in USB interface (Power Macintosh NEW G3/G4, PowerBook G3, iMac, iBook). iMac computers running OS 8.1 require installation of “iMac Update 1.0” and “iMac Firmware Update 1.0” or higher. Interface USB: Cable connection via camera’s USB port is limited to pre-installed Windows 98, Windows 2000 and pre-installed or upgraded Windows ME systems.